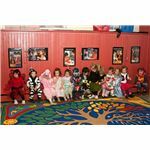 Celebrate fall and Halloween in your preschool class with these nine ideas. Put a new twist on some familiar games sure to delight your students. One way to make some fun preschool Halloween Games is by putting a new twist on some old games for other holidays. Read some of the games below. Discuss them with your students before playing them to see if they can figure out what holiday this game was borrowed from. Fall Bingo: Play BINGO using pumpkin seeds or corn kernels for the markers. Bowling Pumpkins: Use pumpkins for the ball and ears of corn for the pins. To do this, place the ears of corn so that they are leaning against each other and create a sort of tepee. Then, roll the pumpkins towards the corn. Have students get as close as they need to in order to hit the corn, but not so close as to loose the comedy of the game. Costume Contest: Hold a costume contest for adults and let the children be the judges! Creature Twister: Play the Twister Game by changing the colors to different creatures. Instead of using the body, use acorns that the children collect. Have them toss them to hit the creature the spinner tells them to. Leaf Pile Treasure Hunt: Fill a plastic swimming pool with leaves. Hide items in the leaves. Give each group of students two minutes to dig through the leaves and find the items..with their eyes closed!